Boston Red Sox pitcher Curt Schilling listens to a reporter's question in Boston, Saturday, Nov. 3, 2007, during a fundraiser for a Lou Gehrig's disease charity run by Schilling and his wife Shonda Schilling. Former Philadelphia Phillies ace and disgraced ESPN analyst Curtis Montague Schilling may be eyeing the Oval Office in 2024, according to a comment he made on Facebook over the weekend. Facebook screen-grab of Schilling declaration. If history is any guide, taking Schilling at his word means disregarding what he says on social media in favor of a hideously rephrased version obtained just as an interviewer tries to give him an out. He's apparently satisfied with the 3,116 K's he got in the big leagues. In recent years, Schilling has come under fire for his controversial statements on social media. In January 2015, the former Phillie and three-time World Series winner claimed he's not in the Hall of Fame because he's a Republican. Several months later, in August, Schilling rattled off an offensive tweet about the "staggering" mathematical comparison between the rate of extremist Muslims (5-10 percent, according to a meme) and the alleged 7 percent of German citizens who were Nazis in 1940. Sarah Palin came to Schilling's defense, but ESPN opted to suspend him from coverage of the Little League World Series. After an apology, Schilling was reinstated a month later. In October 2015, Schilling jumped at the opportunity to answer a tweet from @realDonaldTrump about who was winning an early Democratic debate. "ISIS," Schilling replied. This was just before a leaked ESPN memo revealed the network had warned its on-air employees to avoid exposing their political views during the 2016 presidential campaign season. A couple of months later, in an interview with Danny Parkins of 610 Sports, Schilling was asked about the email scandal surrounding then-Democratic front-runner Hillary Clinton. Should she be prosecuted and go to jail? Of course, Petraeus was not buried under a jail for his mishandling of classified materials. He resigned and was sentenced to a two-year probationary period and a $100,000 fine. The Mothership's final straw came in April when Schilling shared a derogatory meme directed at transgender people. In an accompanying rant, Schilling argued that the question of bathroom access is very straightforward. At his WordPress blog 38pitches, Schilling defended himself in a post entitled, "The hunt to be offended..." Resorting to the default analogy between opinions and nether parts of the human anatomy, Schilling veered into an inane dead-end on SiriusXM's "Breitbart News Daily." Sadly, Schilling never took his own wisdom to heart after a March 2015 episode in which two men posted degrading remarks about his daughter, a moment for which he deserved sympathy (and he does deserve credit for his advocacy and fundraising for ALS research). "These boys have yet to understand one of life's most important lessons," Schilling wrote on his blog. "In the real world you get held accountable for the things you say and if you are not careful that can mean some different things." For him, it meant ESPN slyly editing him out of "Four Days in October," a 30 for 30 documentary that retraces the Red Sox's historic comeback in the 2004 American League Championship Series. He did, however, land at No. 91 on ESPN's list of the 100 all-time best MLB players, a full 10 spots ahead of Kenny Powers. Here's what people on Twitter had to say about Schilling's presidential aspirations. Curt @Gehrig38 Schilling can't run for president yet. He's only failed in business, government loan payback, and media. More bankruptcies! Tim Tebow wants to play baseball. 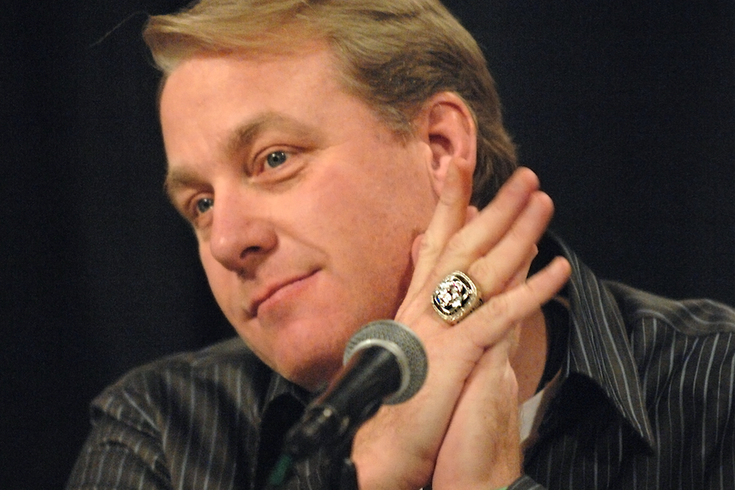 Curt Schilling wants to be president. Reality is pretty flexible for a certain type of deluded jock. So, Curt, what's your pitch to the American people?